Marble Arch Motor Supplies of London in the 1950s. Homepage. This page: A catalogue from the 1950s describing the accessories on offer to the discerning motorist. Marble Arch Motor Supplies Ltd. This catalogue for Marble Arch Motor Supplies dates to the late 1950s, and describes a small selection of the items they had on offer. The majority of their product range was aimed at the motorist, regardless of whether he or she favoured four-wheeled transportation in the form of a motor-car, or two-wheels, perhaps owning a scooter, moped, bicycle or a motorcycle. The cover features illustrations of their premises. The first depicts the frontage of their head office location, at 286 - 302 Camberwell Road in London SE5. Numerous signs, including ones promoting motor accessories, camping equipment, tyres, batteries, paint and games are all in evidence, plastered over what must have been a fine looking building. The central illustration promotes their West End motorcycle and scooter showroom, at 113-115 Edgware Road, where a range of motorcycles, scooters and related accessories were available to buy. For a motorist keen to enjoy economical motoring, but without resorting to riding a motorcycle, then perhaps the display of bubble cars and three-wheelers would have been of more interest. Apparently Marble Arch was able to supply any Heinkel or Isetta bubble car, or Reliant / Bond three-wheeler, to suit Sir's or Madam's requirements. As with the Camberwell Road shop, this must have been a very eye-catching establishment. The imposing building shown at the foot of the cover is Marble Arch's main showroom for motorcycle, car and scooters and spares, again part of the Camberwell Road site. New and used cars were up for sale, as were AJS, BSA, and Ariel motorcycles, along with a selection of sidecars if you regularly had passengers who refused to ride pillion. Signs for scooter manufacturers Puch, Vespa, Lambretta and ISO can be identified in the drawing. 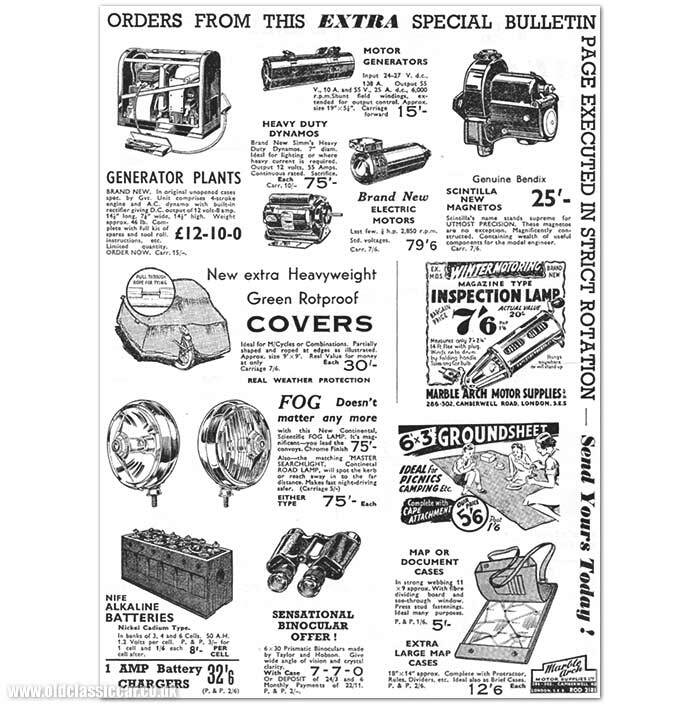 The rear cover of the catalogue describes some of the car batteries and charges that they had in stock, in both 6v and 12v form. Encouragement is also given to any DIY-mechanic who was considering making the switch to multigrade engine oils, either SAE 10-30 for engines in fine fettle, or for the old smokers, 20-40. The cost of either was 12 shillings and sixpence per gallon, no mention of litres in those days. Equally I've gone through the catalogue from cover to cover and found no reference to air fresheners, pink furry steering wheel covers, tacky aluminium-look fuel filler caps, or window tints, all it seems essential buys for the motorist today. Despite the reference to Motor Supplies in their name, there aren't actually too many car-related accessories in this brief catalogue. Various lamps are described, as is a range of car covers, accompanied by a small illustration of what looks like a Ford 103E Pop beneath just such a cover. I wonder if this catalogue was produced ahead of the winter months, as the motor products that are featured tend to refer to motoring and car ownership during the bad weather months. Half a page is given over to after-market car heaters and radiator heaters, all designed to make owning and driving a car in winter a little more bearable, especially given that many basic cars of the day didn't come with heaters as standard. If anything, most of the content in this publication relates to owners of motorcycles and scooters. Riders in London who used their machines on a daily basis were probably familiar with Marble Arch's motorcyclist's section, where a selection of "pudding basin" crash helmets, goggles and gauntlets could be perused. Motorcycle coats in various styles were stocked, ranging from heavyweight PVC jobs designed for hardy blokes on their big British motorcycles, to lightweight water-proof two-piece numbers designed for "business girls" who used scooters to commute around the city. Products aimed at female riders included the "Nonbetta" coat, the "Scooterjak" suit, the "Mentone", and the "Lincoln". The range of gent's motorcycling garments was even more extensive, with products such as the "Challenger" stormcoat and the "Black Panther" suit designed to relieve you of your hard-earning shillings, in return for a more comfortable ride. Pannier sets and fairings could be ordered at Marble Arch Motor Supplies, with prices of the "Weslite" Sports De Luxe fairing costing, for example, 7 18s 6d. Camping goodies for sale at Marble Arch Motor Supplies. Customers of Marble Arch were evidently hardy types, happiest when enjoying the great outdoors regardless of the British weather. A number of camping products were described within the pages of this catalogue, at a time when most holidays were still taken in the UK. The "Marble Arch" tent was a good seller by all accounts. Prices started at 6 17s 6d, and some 2,000+ examples had been sold the previous year, with no complaints received. The company was in business prior to WW2, and continued trading well into the 1970s at the very least. Whatever became of this once-prominent motor spares and accessories supplier? And do any of the original buildings survive? A search online for properties on Camberwell Road brings up, amongst other things, a modern block of flats at number 293, so perhaps the head offices and main showrooms were demolished to make way for housing. The Edgware Road address brings up references to a chain of bookmakers. 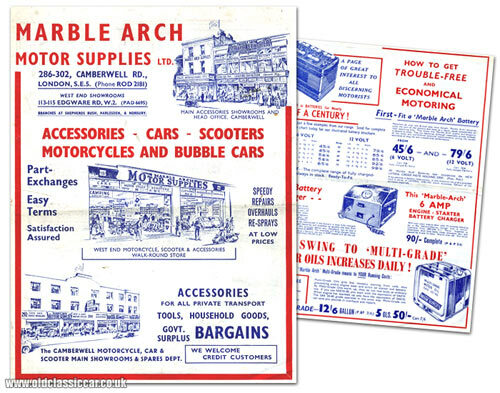 Does anyone have memories of buying from, or maybe working at, Marble Arch Motor Supplies Ltd? More items relating to the history of motoring may be found in the Motoring Collectibles section. Other catalogues similar to this one, include a pre-war publication describing the range of Seagreen car products, dated 1937.